Hunter Cabot met his wife Sara when they were college students and fell in love with her at first sight. They have been married for fourteen years, and for most of that time, their relationship has been a happy one. But two years of struggling with infertility has put pressure on the marriage, and the cracks are beginning to show. The differences in their upbringing and personalities that once seemed insignificant have become sources of conflict. Sara grew up with educator parents devoted to each other and to their children. The family bond was a close one; they all enjoyed time together. Sara always expected her life with Hunter to replicate her life with her family in significant ways. She is devastated by the thought of remaining childless, and she resents Hunter’s immersion in his job and feels that he does not share her unrelenting desire to have a child or her pain over the loss of the dream she believed they shared. Hunter’s parents divorced when he and his sister were young. His father remarried and had a daughter with his second wife. Hunter’s mother nourished her bitterness over the divorce, and Hunter grew up feeling that he had to earn his father’s approval. He has used the family company, the Cabot Tea Corporation, as his means of doing this. He began working at CTO when he was a young teen and has worked his way to his current position as CFO. His father has promised that Hunter will one day lead the company. Hunter has ideas that he believes will keep the company viable in the twenty-first century, and he is eager to begin implementing some of them. He and his stepmother are antagonists in every sense of the word, and Hunter feels betrayed when his father appears to be seriously entertaining her suggestion to sell the company and retire a wealthier man. Hunter wants Sara to be happy, but he also feels that she should be more understanding of the demands of his career. Before I Knew, the first book in the Cabot series, made me a Jamie Beck fan and sent me searching for her backlist and looking forward to the next Cabot book. All We Knew did not disappoint. Beck creates a marriage-in-trouble tale that involves two fully dimensional characters who love each other but are fearful that they are losing the connection that has grounded them. Their conflicts are layered and real. The tensions within the larger Cabot family play a significant part in the story, and Beck presents them as credible, complex struggles that resist simple solutions. 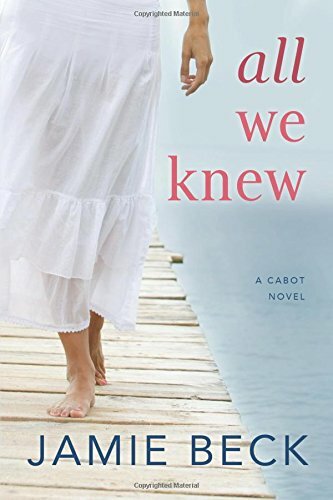 If you like contemporary romance that involves believable problems and family relationships with all their confusing, sometimes contradictory emotions as well as the promise of happiness for the central couple, I think you will enjoy All We Knew as much as I did. Although I recommend both this book and the first book in the series, this one can be read as a standalone. Gentry Cabot’s book, When You Knew, a June 26, 2018 release, is already available for pre-order. The blurb says that Gentry hires a male nanny for her son. I can’t wait for that one. I really like the plot as described here and look forward to the book's publication. Thanks for sharing your review, Janga. Great review. I have added this to my wish list. Another new to me author. I should say thanks, but you are killing me 'cause I always want another book. Thanks for the kind words, ladies. I think you have a treat in store if you are just discovering Jamie Beck's books. I'm reading an ARC of this book right now. Oh no!! Not sure I'm going to like the ending if that's the premise of book 3. Thanks for the review. Like you I really enjoy reading Jamie Beck's books. Good to know that the book can be read as a standalone. That's always important for me.